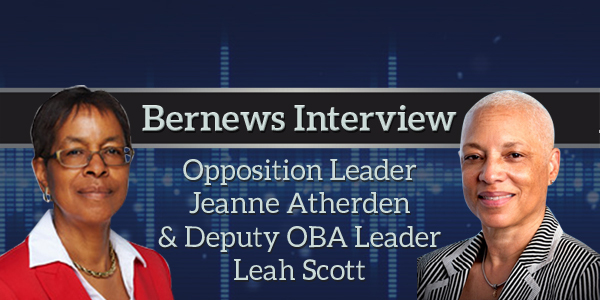 Opposition Leader Jeanne Atherden and Deputy OBA Leader Leah Scott are speaking with Bernews this evening [Dec 7], sitting down for a live interview with journalist Jeremy Deacon. Last month, Ms Atherden was elected the new leader of the OBA winning 90 votes [37.3%] to defeat Patricia Gordon-Pamplin who won 82 votes [34%] and Craig Cannonier who won 69 votes [28.6%], while Leah Scott was selected as the Deputy Leader by acclamation. really, really poor interview by oba. too bad PGP isnt leading. their message is nothing, along with ‘consulting’ the public. PLP took your breakfast, lunch and dinner. wrong strategy! These 2 UBP leaders actually bored the crap out of me faster then watching paint dry on a glass wall. Cross the floor Leah! Quite obvious! This was a bad interview. No other way to look at it. I have seen all types of interviews over the years and I have to say this was a classic example of, do not call or have an interview unless you have something to say and a message to convey. Until this Interview I was a fan of MP Leah Scott but this painful watch hurt me emotionally on many levels. There was clearly zero preparation, something you never do before an interview of any kind and MP Atherden’s feeble attempts to pursuade us that Nick Kempe isn’t ready for the national stage failed. Politicians be warned, use this Interview as your example of where never to fall with your political career, all I can think is, when are MP Atherden and MP Scott going to simply resign and put themselves out of what is visibly something they have no interest in, service. Those two don’t know why their party lost the election. So ! you are thinking that now canvasing the island will solve the problem, forget it ,that is pre historic. They were 4 years too late as they did diddly squat back then. Don’t tell me what you can do ,show me, follow the money. They did more that loose the election, they lost the island to a $70, mill boat race. After all, you are being paid to do the job. OK so the OBA have retreated into that thinking that to win elections you MUST have a particular face out front? Even if voters continue to fall for the bait and switch approach, I must insist that Jeff Baron, Nick Kempe and Andrew Simons to name a few ARE the future and the ONLY candidates who we will believe in so why wait? To suggest that the CEO of a locally owned company doesn’t have the bandwidth to be a party Chairman and Senator in this era of technology and in 21 square miles is really grasping at straws. I commend Nick Kempe’s resignation and encourage him to be a founding member of the Bermuda Democratic Alliance (version 2), which will hopefully rid itself of the hangers on who keep advising the top brass that Interviews like this are a good way of communicating with the electorate. This is fantastic news.Leah Scott, months ago, did not know which way to turn. Now, she is opposition deputy leader. I agree with you…..CROSS THE FLOOR ,LEAH! !